I’m a doc; you get to where you can tell a lot just by looking. A 50 year old guy drags in, a smile on his face because he has learned to smile and not because he is happy, and he says “I’m tired of being tired” and you know his testosterone is low no matter what else is going on. Can’t remember? Low T. Kids driving him crazy? Low T. Which is cause and which is effect is too long a story to tell here. Now he had to work to double his testosterone and raise his IGF-1 (a reasonable surrogate for growth hormone in most cases). But he would tell you it was worth it many times over. His work life improved, his home life improved. His sense of well being increased dramatically. He was his happy youthful self again. As you will know from my other posts his risk of heart attack, stroke and cancer all improved. He didn’t take anything. In fact I asked him to quit taking even his daily multivitamin. As you will have noticed this transformation took just over a year and a half. While these blood markers were at approximately 3-4 month intervals we were seeing his every workout heart rate profile and reviewing his workout logs for exercise sequencing and selection. By meticulously tracking each detail he achieved these results. Adjustments were required along the way and always guided by this kind of data and not whether his bench-press increased. In fact his training was so varied he did not have the standard one, two or three markers: squat, dead and bench. There is so much endocrinology and physiology unintentionally concealed in these graphs I will only touch on a few features. First notice that his cortisol went up dramatically at the second data point. Though his cortisol level was too high to begin with the shock of diet change and increased and changed exercise was even more ‘stressful’ for him as evidenced by the cortisol jump. This is a very real danger when big changes are made. 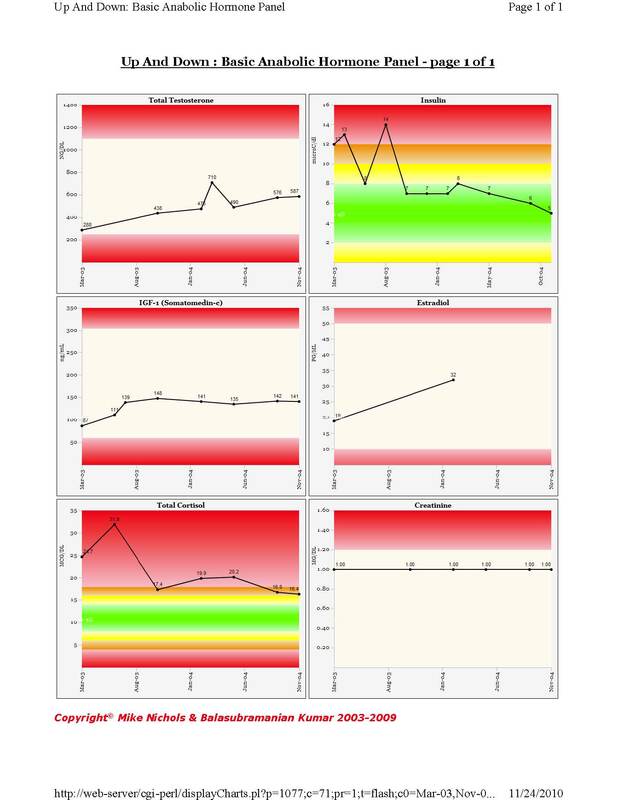 We were comfortable with this pattern, though usually not to this degree, because we were seeing step-by-step improvements in his heart rate response to exercise; earlier, faster rise and increased heart rate recovery. Further his interim IGF-1 was up even in the face of the cortisol spike which as a rule would suppress it were it long term; that is weeks or months rather than days or weeks. Now in a case like this, someone with the Insulin Resistance Syndrome, one of the fundamental keys was his fasting insulin. Now fasting insulin is related to genetics and diet but exercise properly done, in an environment of lower cortisol, increases insulin receptor sensitivity and thus lower insulin levels are required to maintain acceptable glucose. This is one of the protective mechanisms of exercise in the case of diabetes. Now, not seen here but a clear part of his program was a changed pattern of response to circumstantial stressors. He always practiced body scanning after every workout; laid down on the mats, closed his eyes, attended to his breathing and relaxed every tense part of his body sequentially; other stress management tools as well. He had a package, a whole person approach, but it was always guided by the precision and objectivity of heart rate profiles and blood test markers. Now here is the sad part. After all of this fantastic change one of his parting questions to me was whether he could go back to eating pizza. I haven’t seen him for awhile but with that as one of his exit remarks I have my doubts. I know this; if he has stayed in dialogue with these kinds of objective markers he will have discovered the answer himself: the T would have crashed and he would have gotten back to work. Life is full of surprises. However, when it comes to your health it can be like a tightrope walker relying on wet toilet paper for a safetynet. The safety net being all of the pharmaceutical approaches necessary for those who have not maintained or improved their health by the objective techniques I am trying to encourage you to adopt by these posts. Change will come, we will all die, but how soon that will be and how you will feel on life’s path is up to you. I know of no better way to find your way along that path than external, objective parameters that show you, that mirror you, and your stress, exercise and diet behavior. The capacity of self delusion is spectacular. We all think we are doing well. When in fact what most people do is find the one variable they can control- their income, their squat weight, their body weight, whatever- and they edit out the ones they can’t control or do not understand. We become so focused on what we can do that we become literally deluded about other things. In this man’s case: I am successful so everything else is fine too. Not so; he had the hormones of a man 30 years his senior. It would not have worked out very well; he would have walked right off the end of that pier with a rich young wife at the funeral. Are you confused about the right diet, the right kinds of exercise and the most effective relaxation techniques? Well, your body is not. Query it. Ask it questions. Hey, body, this is mind speaking; how is my testosterone and my triglyceride level? You will need an interpreter to understand the body’s answer. The interpreter is blood tests and heart rate profiles and sleep logs and, sometimes, even the mirror.